especially when working in Google Drive and Google Classroom. It is important, though, to frequently check for updates to keep Chrome running smoothly and efficiently. Our tip for this Sunday will help you complete that process in just a few minutes. On the upper right-hand corner of the Chrome Toolbar, you’ll find a “Customize and Control Google Chrome Icon”. If your browser needs updating, you will find the “Update Google Chrome” message. After you click on “Relaunch”, your Chrome browser will close, update, and reopen with the same tabs that you had before you updated. and Chrome will once again check for updates. 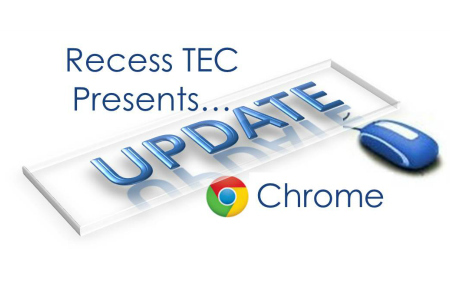 We recommend checking for updates on a regular basis to keep Chrome running smoothly for you and your students. and we hope the same is in your forecast. One more tip is to find some outside time with family and friends. We would also like to highlight last week’s post if you missed it. We are heading to EIASE once again this summer to host our own workshops. If you haven’t already registered, we invite you to follow this link to do so online. We’re featuring Google Classroom, iPad workshops, and general technology integration in your curriculum. Each session is two hours long, and we promise to jump right in and give you what you need to get excited about next year! and one of my “homepages” will be gone. In 16 months, I’ll say “Good-bye” to iGoogle. I have plenty of time to prepare and, in fact, have already started. It was something I heard at EdCamp-Chicago from an IT person at a high school where they not only use Chrome as their “go-to” browser, but have adopted 1-to-1 Chromebooks for their students and staff. I downloaded Chrome and began looking at it carefully. With each new tab, my “homepage” was designed. I visited the “Chrome Store” and chose the apps that I most often use. And I shopped the themes. it’s the one I choose.